It was a busy weekend for Warsash Sailing Club on 9-10 April when Saturday racing for the Spring Championship was added to the penultimate gathering of the Spring Series on Sunday. On Saturday the Solent provided 'champagne sailing' – a sparkling day with a perfect sailing breeze. Sunday was a time for patience. The two Big Boat classes saw a number of teams out for the first time including Bob (Farr 52), Dark and Steamy (DK46) and the Swan 45s Nemo of Cowes and Wolf in Sheep’s Clothing. There were also university teams from Oxford, Cambridge and Surrey, using the event as training for the BUSA Nationals racing the new Sunsail F40s. Oxford and Cambridge also had a private tussle for the Varsity Yacht Race. The weather forecast for the weekend proved very accurate, promising quite different conditions for the two days. Saturday brought a southeasterly 10-15 knots blowing in from the Nab Tower direction. Overnight the high pressure built and Sunday morning saw the same blue skies but with very little wind. The Spring Championship got off to an excellent start with testing but ideal conditions. Course setting was comparatively easy for the race officers in the steady breeze. The Black Group Spring Championship classes were divided into Big Boats 1 and 2, Farr 45, First 40.7 and J/109s. Race Officers David Greenway and Peter Bateson used laid marks to adjust the length of the beats and runs for the different classes and efficiently completed four races. Peter Knight was overseeing the sportsboat classes for Laser SB3s and J/80s with a race track set up in the entrance to Southampton Water. Again the full schedule finished just in time for everyone to be back in the clubhouse to watch the Grand National. In Black Group the BB1 and Farr 45 classes started together. Bob (formerly Bear of Britain) the Farr 52 campaigned by Rob Gray, Sam Laidlaw and Tony Hayward was the biggest boat and fastest round the course, taking four guns in four races and a win on handicap in two. Nick and Annie Haigh (Dark and Steamy – DK46) proved the handicap winners in the first and fourth races. Niklas Zennstrom’s Ran took the first three races for the Farr 45s but was prevented from a clean sweep by Rebel (Stewart Whitehead) in the last race of the day. The tightest competition came in BB2’s second race. Michael Bartholomew’s Tokoloshe (King 40) took the gun and held the class win by 10 seconds from Peter Rutter’s Quokka 8 (Grand Soleil 43) who beat Jammy Dodger (J/133 – Neil Martin) by two seconds. On the water La Response (First 40 - Andrew McIrvine) finished a foredeck ahead of sistership Tarka II (Guy Prest), but had to share fifth place and points with Jim Macgregor’s Elan 410 Premier Flair. Tokoloshe took the next two races to lead overnight from Quokka 8. In the J/109s Velvet Elvis and J/Dream could not be separated with identical scorelines of two wins and two second places. The Oxford and Cambridge teams, also using the weekend to decide the 2011 Varsity Yacht Race, were sailing their Sunsail F40s in BB2. The first race was a non-counting practice and the Oxford boat then went on to take the next three races. In White Group, three boats opened up a small advantage in the J/80 class after their four races. Patrick Liardet (Aqua-J) led by one point from Dan Brown (Henri Lloyd Shockwave) with Tony Hanlon’s RAF team on Spitfire a further point away. With 36 boats entered in the Laser SB3 class this is the largest in the event. At the top of the leaderboard is Team Russia (Oleg Zherebtsov) level on points with GBR3082 (Joe Llewellyn) while Craig Burlton (Gill Race Team) and World Champion Jerry Hill (3 Sad Old Blokes) are a handful of points behind. With another seven races scheduled for next weekend, the outcome is still very much in the balance. On the television it was reported that the temperature in Bournemouth was higher than in Bermuda. In the Solent the high pressure system resulted in brilliant sunshine but virtually no wind. Competitors and race officers had a long wait whilst some skippers carried out housekeeping jobs aloft on the rig and others read the Sunday papers. During long postponements like this it is customary for some crews to enjoy a swim, but not usually during the Spring Series when the water temperature is 10 degrees Celsius! However, undaunted, the university teams from Oxford and Cambridge, racing in Black Group, nonetheless entertained everyone by taking a quick dip. It was an agonising time for the race officers hoping for the breeze to be sustained above 5 knots and from a steady direction. The mark laying boats were constantly being sent off in readiness only to return when the fickle breeze spun round and back. Just after noon, Black Group PRO David Greenway and his team stationed near Universal Marina buoy took the brave decision to get racing underway in a very localised south-easterly gusting to 6 knots. Classes were combined into three starts with the time limit extended to two and a half hours. IRC1 were set a laid windward mark just north of the Ryde Middle Bank followed by a run to Fastnet, beat to North East Ryde Middle and three further laid marks finishing near the start. The first start comprised IRC1, Farr 45 and both Big Boat classes. The ODM end of the line was favoured by many. Two were caught out as OCS but only Neil Kipling’s Joopster failed to return although she is contesting this. On the next start, for IRC2 and the J/109s, the committee boat end held the most attraction but with such a large number of boats, the fleet was spread evenly along the line by the gun. Finally, at 1250 it was the turn of IRC3 and the Sigma 38s who got clean away. The breeze held whilst the boats were beating and, with a weather-going tide, everyone made the top mark in reasonable time. The bigger boats in the first race made good progress but as they started their second beat the wind was already fading and their course was shortened at the end of the next run which enabled everyone to record a valid finish. For the smaller boats in the second and third starts, life was more difficult. The boats were slowing down by the windward mark and progress was painfully slow on the run which sometimes turned into a shy spinnaker reach to Hamble Yacht Services where the course was shortened. Two factors were critical. Gaining clean air was vital with so many boats sailing lower trying to gain an advantage only to find that the wind shadows from the boats above them extended much further than normal and the increased adverse tidal flow held them back. The other element was to choose the correct time to gybe along the mainland shore. Those that got it right made significant gains. Trustmarque Playing Around (Peter Robson) rounded the top mark behind Sailing Logic’s Visit Malta Puma in IRC2 but pushed on much closer inshore, gybed, switched to a more asymmetrical spinnaker and gained over five minutes’ advantage at the finish – enough to achieve both line and handicap wins. In IRC3 Stiletto (John Barrett and Paul Woodward) and Mongoose (Tom Snowball) carried on their initial gybe the furthest and were well into the back markers of IRC2 by the new finishing line. This gave Stiletto her third class win and a six point lead overall going into the final race, now a discard is taken into account. In the Varsity Yacht Race, Oxford University made a clean sweep over Cambridge University but in the combined race on Sunday another Sunsail F40 entered just for the day when Surrey University was pleased to beat both the others. In the J/109s Jahmali went furthest inshore and won this one-design class by four minutes. Sadly, the breeze did not materialise for the White Group boats and IRC4 gathered nearer the shore. Peter Knight and Jon Spencer abandoned racing at 1230. 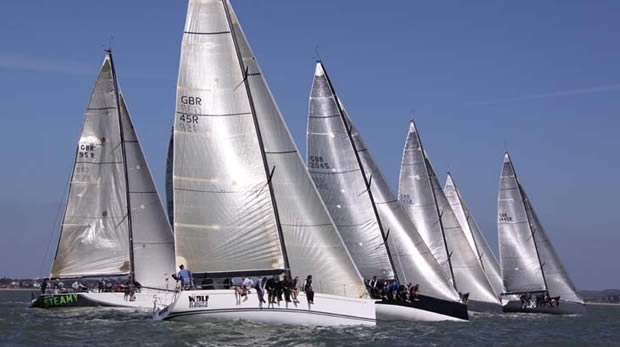 16-17 April sees both the final Sunday in the Warsash Spring Series as well as the second and final weekend of the Spring Championship. None of the classes has been finally decided in either and so the competition is likely to be close and the atmosphere electric. All that is needed is a decent amount of wind, which has been elusive this spring, and it will be a fitting climax to the start of the 2011 season. Oxford University (captain Vanessa Johnen) beat Cambridge University (captain Julia Toynton) by 52 points to 56.